Hey everyone! If you’ve been following my Instagram, @eatdrinkclt, you know two things about me: I live in Charlotte, NC, and I have a serious obsession with food. After much encouragement from my friends and co-workers, I’m taking this baby online! After all, you can only say so much in a caption. Here, you won’t find a sophisticated restaurant review from someone who knows tons about food. I just want to share my awesome dining experiences and hope that you’ll branch out next time you go out to eat in the Queen City. Honestly, I’m just a chick who’s hungry. Constantly. So I’m sure you can relate. 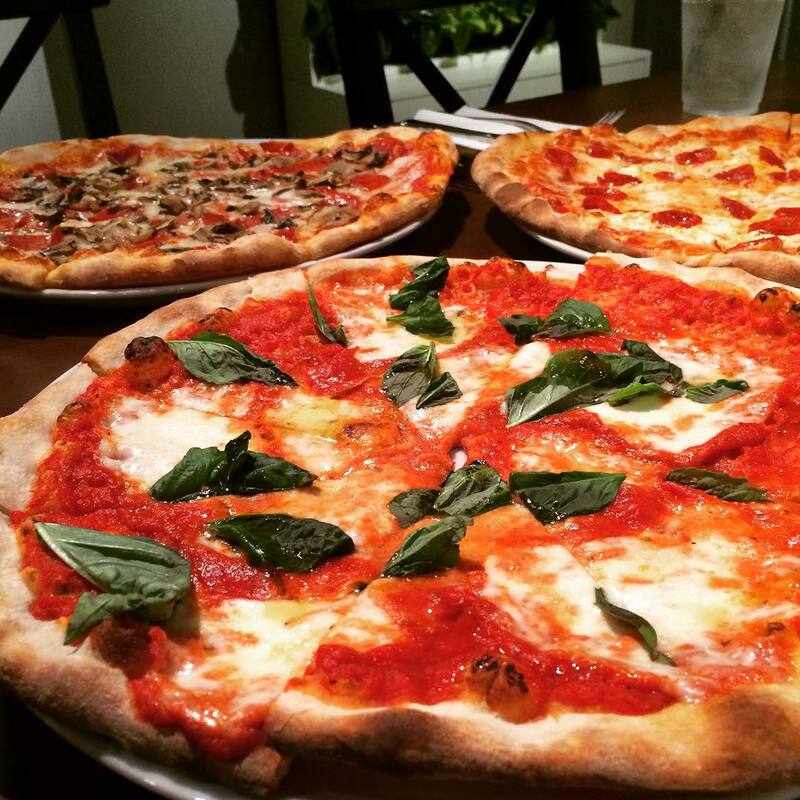 Last night, we checked out Pizzeria Omaggio, a three-day old pizzeria at the Metropolitan. After hearing about it through Instagram and reading the menu, I knew we had to get there. Fast. When we walked in, we were immediately greeted by the owner, a super friendly man who I recognized from their Insta account. After ordering at the counter, we were able to choose our seat at either a table or at the bar, which overlooks the chefs in the kitchen. We chose a table, but next time, the bar is a must. I love watching people cook! Our appetizer, the Bruschette Originale, came out super quick and was delicious (sorry, forgot to take a photo… too hungry.) Our pizzas came very soon after. I was surprised by the size – you definitely get your money’s worth! I had the Pepperoni with mushrooms added (see top left of the picture) and it was GREATTT. The ingredients were super fresh, and I loved the tiny pepperonis. Needless to stay, I’ll be returning to Pizzeria Omaggio. The comfortable atmosphere, friendly staff, and authentic pizza blend together to create a great new addition to CLT! Plus, I love me some pizza. Always. Next Post Beer? In cheese? I’ll take it.